Students will recognize and pronounce words that follow the c-v-c-e and v-c-e rule where the first vowel is a long vowel and the final e is silent. Students will be able to spell and write simple long vowel words with c-v-c-e and v-c-e spelling patterns. There are several regular long vowel spelling patterns in the English language. The c-v-c-e pattern (consonant-vowel-consonant-final e) is a long vowel spelling pattern which occurs quite frequently in early reading and spelling. Basically, the phonics rule for this pattern states that when a vowel and a final e are separated by a single consonant, the first vowel is long and the final e is silent. Some words that follow this rule are cake, scene, kite, hope, and rude. The c-v-c-e pattern occurs most frequently when the long vowel is a, i, and o and less frequently when the first vowel is e or u. The song Silent e (Sing Your Way Through Phonics Volume 1) teaches children how the vowel sound can change from a short vowel sound to a long vowel sound when a silent e is added to the end of a word. For example the short i in hid changes to a long i in hide, the short o in hop changes to the long o in hope, the short u in cut changes to the long u in cute, and the short a in cap changes to the long a in cape. By continually alternating between the rule and examples of the rule, the song Silent e helps students apply the long vowel -silent e rule in their reading and writing. Other long vowel spelling patterns are covered in the Sing Your Way Through Phonics Vol. 2 song, Spelling Choices. Be sure to read the “Extensions” section below for additional silent e activities and for additional words with c-v-c-e patterns. Note: If you do not have the CD or Mini-Charts, you can still teach this long vowel - silent e spelling pattern lesson plan using the folk tune listed on the Silent e Song Lyrics page. You can create your own mini-charts using the words in bold print letters in each verse of the Song Lyrics. Ask, "So what happens to the vowel when we put a final e on the end of a short vowel word?" (The short vowel becomes long and the e is silent.) Practice reading and saying the vowel sounds in the words on Mini-Chart pp. 78-85: cut /ŭ/, cute /ū/, hug /ŭ/, huge /ū/ [Note that the letter g changes its sound, too. ], cap /ă/, cape /ā/, tap /ă/, tape /ā/, pin /ĭ/, pine /ī/, fin /ĭ/, fine /ī/, pan /ă/, pane /ā/, can /ă/, cane /ā/. Play Silent e (Sing Your Way Through Phonics Vol. 1 CD, Track 17), pointing to the Mini-Chart words and asking the children to join in the song as soon as they think they know the words. Joining in the song will be easy because the format remains the same for every verse. Example: "How do you change rid to ride? Silent e. How do you change hid to hide? Silent e. How do you change rid to ride? How do you change hid to hide? End the word with silent e."
Play the CD again, and ask Group 1 to sing the part that Group 2 sang and vice versa. Review the Long Vowel - Silent e rule aloud together. "When e is added to a short vowel word, the short vowel becomes long and the final e is silent. Practice singing Silent e daily for a week. Then try singing the song without hearing the words, using the instrumental track (Track 18). Allow different students to point to the Mini-Charts words while singing. Help students create other sets of c-v-c-e or c-c-v-c-e words for the song. Make 8 copies of Mini-Chart Template B on p.96 and allow students write in the new sets of words. 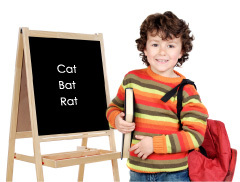 Examples: sal/sale, pal/pale, quit/quite, bit/bite, not/note, tot/tote, tub/tube, cub/cube, slid/slide, bid/bide, shin/shine, spin/spine. Place these pages back-to-back in page protectors in a 3-ring binder. Then sing the song with the instrumental version (Track 18). Mark the original words and the alternate examples with symbols for short vowels, long vowels, and silent e.
Introduce the Read-and-Sing Book, Silent E. As readers sing along with the lively song set to the folktune Hinky Dinky Parlez-Vous, they can read the short vowel words and predict the long vowel words before they turn the page to verify their guesses. In this book, characters are in the business of painting signs. At first, only part of the word on the sign is visible. When the page is turned, the complete word is visible. The partial word has a short vowel sound which changes to a long vowel sound when whole word is painted. Children can learn about additional long vowel spelling patterns in the Read-and-Sing book, Talking and Walking. Keep a few copies of the book at a literacy center equipped with headsets so that students can gain practice in listening, singing, and reading long vowel - silent e words. Create a silent e flip chart by covering the final e in each word with a sticky note. Children can read the word without the final e, then flip the sticky note and read the word with the final e.
Play a sorting game by placing long vowel word cards and short vowel word cards in the appropriate pile. Try selecting words with a theme like animals, foods, adjectives, or names. Students read all the words on Mini-Charts pp.74-85 without assistance. Students correctly pronounce vowel patterns e_e, a_e, i_e, o_e, and u_e.